Spider-Woman | OMG I'm fifty! Why on earth did I end up doing this job? I have no recollection whatsoever of applying for it, being interviewed, negotiations taking place, a contract being signed, or a big monthly salary being transferred to my bank account every month. I have been provided with no special equipment, no protective jumpsuit or gloves, no stepladders or scaffolding for easy access, no finely meshed net for a quick catch. Yet I’m the only person around here doing it. And it’s not a job a lot of people dream of as a kid. Except grotty, snotty, little bug-bullying boys perhaps. I’m none of those. Remover extraordinaire of the many, many, way too many, eight-legged insects that manage to make their way into our home. I don’t even want to start thinking about how or where they enter. They just seem to appear. Usually before bedtime. Usually in the girls’ bedrooms, just above their heads. “Muuuuuuuuuuuuum. Can you come up, please?” At least they say ‘please’. But why don’t they shout for Daaaaaaaaaaaad? Probably because he is out at the swimming-pool, or running track, or pedalling away on his featherlight bike. I don’t suppose he can be both an Iron Man and a Spiderman. So I traipse up the stairs and spy the little bugger on the ceiling. Little is not really accurate. Big bugger. The size of a two-euro coin, if you’re European. I won’t be soon so I’m making the most of this spider-sizing reference before I’m stripped of my pretty blue and gold-starred flag along with all the other Brits. The two-euro coin is sometimes just its body. The legs turn it into the size of a Mr Kipling’s individual Bakewell Tart. I wonder who eats them these days? Due to the lack of stepladder, scaffolding or net, I stand with wobbly legs on the bed, holding a hastily snatched magazine in one hand and a sheet of paper in the other. No, not to kill it! Who am I to decide on this poor creature’s fate? With age I’ve gone all peace-and-love-thy-insect-neighbourish. Except for wasps. I’d kill a wasp in the bat of an iPad. The spider, on seeing the scary sheet of paper, panics and runs off in the other direction where I surprise it with the magazine. It sprints onto it and it’s mine. The problem then is keeping it on the front page without it either touching my hand (I couldn’t deal with that) or falling off entirely. Whichever daughter is concerned has already opened her window and I shake the whole thing outside to make Mr Kipling drop off into the dark void below. And no, I don’t care at this point what happens to it. It can plummet to its death or be saved by a passing bush. I couldn’t really give a monkey’s. My mission has been accomplished here. Gone is the love-thy-insect bit. But there’s still a big question hovering over our heads. How come I can do this without having a heart attack and dying on the spot, but my girls cannot? Deep inner strength and composure? Lack of fear in all areas of life? A former life as a spider’s mum? All of the above? Yeah, right. 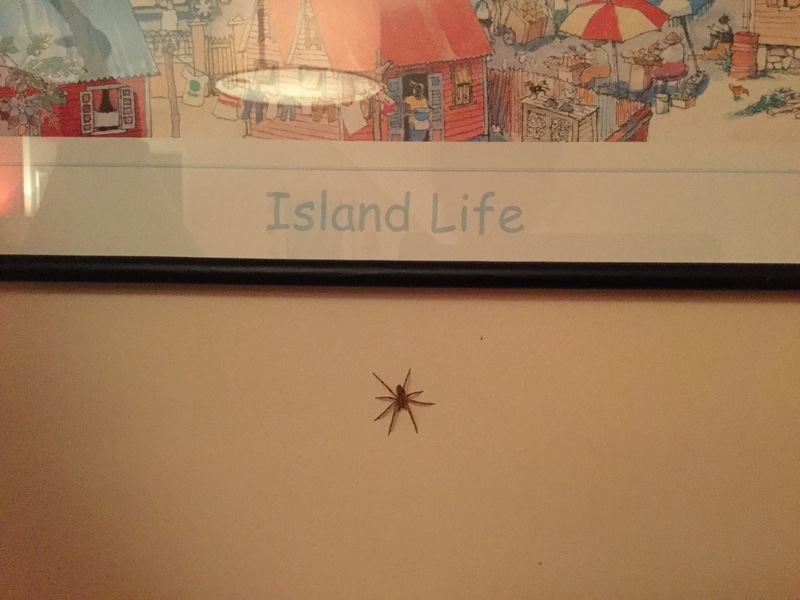 It could just be that I am the only one in our household who can see a big fat spider lurking amongst the piles of books on my bedside table, or scaling the slopes of our bedroom ceiling, yet manage to turn off the light and fall fast asleep anyway. My dreams may be rather dark and arachno-filled, but amazingly I’m out for the count, in spite of the creepy, crawly, scratching noises going on beside my weird and fearless head. Pffff. This is a baby one. Fifty cents , no more. This entry was posted in Non classé and tagged children, family, home, humour, Life, mum to the rescue, real life, spiders, wtf?. Bookmark the permalink. Lots of giggles whilst reading that one, Juliet. 👍👏🏻.